I encourage you to investigate this new Timeline of Information History. 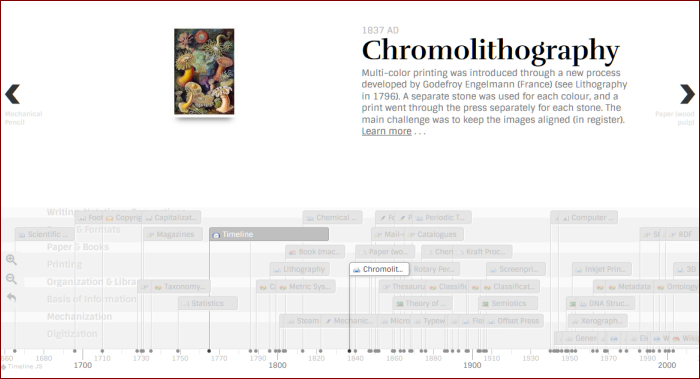 TimelineJS (or JS3 in its latest version) is an open source and cloud-hosted timeline from the Knight Lab at Northwestern University. They provide a plugin to WordPress, with calls via either shortcodes or a simple PHP statement. They provide a dead-simple online form for generating your own timeline quickly, which they then host. If you prefer to fiddle with all of the dials and knobs, Knight Labs also offers code and clear instructions for calling and using the libraries locally. Their lead is “Easy-to-make, beautiful timelines,” and I agree. In my own configuration of WordPress my Timeline of Information History is not a post, but a separate page with its own PHP template. None of the direct WordPress options suggested by Knight Labs worked for me, including the plugin, but I was able to post the code generated by the online form directly into my current PHP template. (My guess is that simple WordPress blog sites and posts would work with their standard set-up.) If there are additional style changes I want to make down the road, I will need to bring in the Timeline JS3 libraries and host them locally (there is a small suite of canned, online options; further CSS or style changes require that you have your own local install.) For now, I am deferring this possible step. With a bit of fiddling, it was not too difficult to convert the existing XML format of my prior Timeline to the CSV (Google spreadsheet with fixed columns) format of Timeline JS3 (which actually uses the JSON generated from the spreadsheet). I also did some editing and link corrections while doing the migration. It had been a while since I had used the Google online spreadsheet. I found it much smoother and responsive than my last uses of it. Copying-and-pasting across environments also works nicely. The <iframe> code generated by the online form worked as is when embedded in my existing PHP template. The instructions should you want to install the libraries and host locally appeared equally clear. In all, my experience installing the new Timeline and migrating its data was pleasingly smooth. But, no matter what, code, environment and data changes do take some effort. Now that it is done, I am happy with the results. This marks the end of nearly a decade of use on my blog of the Simile tools from David Karger‘s shop at MIT. Two of this blog’s former tools, Exhibit and Timeline, were developed by the skilled and innovative David Huynh. David was a toolmaking fool during his MIT tenure, including Sifter and Solvent and Potluck, besides Exhibit and Timeline. After he went to Metaweb (and then Google) he developed the data wrangling tool Gridworks, which was renamed Google Refine and then Open Refine when it went open source. Any one of these tools is a notable contribution; the innovations across the whole body of Huynh’s work are quite remarkable. I’d like to thank the Davids, Larry and others at the Simile program that made so many contributions at a pivotal time in the semantic Web and Web of data. Good job, all! We won’t soon see that era again. I have been a WordPress user, self-hosted, since Day One of this blog. My first big blog effort was a comprehensive guide to blogging with WP . I’ve spent many years with WP, but it is distinctly feeling long in the tooth. These JS conflicts that appear out of nowhere are, unfortunately, not an uncommon occurrence with WordPress. I routinely have spam, bot, and hacker attacks, probing virtually every area of my blog and trying to break into my administrative area of WP. My counters for fending off malicious probes and attacks are in the millions. For years, my site sometimes has race conditions that I have been unable to track down and correct. There are certainly conflicts between plugins, but the relative rarity and what exactly the conditions are to trigger the race conditions have yet to be discovered. Periodically trying to track down the root issue has been frustrating. Truthfully, I still do not know what they are. Web and UI design for the Web has evolved substantially, especially over the past years of growth and then dominance of mobile. In the case of this blog, AI3, which is solely authored and managed by me, I also do not need many of the aspects of a full-throated blog or publishing site. WordPress also has poor performance and difficulties optimizing performance. Tuning Web servers is a nightmare for the amateur. I have tried various caching and CDN strategies. While performance can be improved with these strategies, they come at a cost of their own glitches and added complexity. These factors have caused me to look closely at static site generators. In my style of blogging, I make many edits while drafting and may have multiple drafts being worked on over weeks. But, once published, there are not many edits. From the standpoint of the Web, reading can be emphasized over writing. Yet, despite its simplicity and better performance, there are also challenges in workflow and tooling in going to a static site design. There is also the daunting question of how best to convert my existing WP data to an accurate, readable form without massive manual changes. I would not make the change to a different blogging platform without carrying my prior writings forward. Looked at in this way, my WordPress continues to work with the occasional burst of effort, like this current one in switching out timelines. I’m still mulling the more fundamental change away from WP. The chicken is clucking the closer I get to the chopping block. An archival version of this document, Comprehensive Guide to a Professional Blog Site: A WordPress Example, can be downloaded in PDF. But realize this guide is now more than 11 years old, and not much is likely applicable to the current Web. I have updated this blog's interactive Timeline of Information History to new timeline software, with comments on how earlier tools are becoming outdated and needing to be replaced, including possibly WordPress.